For many members of the River City Sound Chorus, quarteting is what it’s all about. As a member of a barbershop quartet, you have the opportunity to sing for a wide variety of audiences, experience venues large and small, and undertake an incredible musical voyage. Below is a list of our active quartets. Please feel free to contact them for more information regarding their repertoire, fees and availability for your event. Harlequin: noun: in the Middle Ages – a light-hearted, nimble and astute servant in a checkered costume, a court jester, an entertainer or clown. Well, we may not be all of these and we’ve only been around for 15 years not 750, but we love to entertain and we sometimes wear a checkered vest. In 1998, the four of us decided to form a quartet and chose the name Harlequin to reflect our commitment to entertainment. We had each sung in previous quartets but this was certainly a new adventure. From the start we dedicated ourselves to singing well, mostly in the barbershop style. Our repertoire includes ballads and up-tunes; gospel and comedy, and 50’s doo wop too. As a quartet we have achieved many of our goals…winning Division Novice Quartet in 1999, Winnipeg Chapter Quartet of the Year 12 times and Manitoba Senior Idol in 2013. Over the years Harlequin has headlined shows in Manitoba, Saskatchewan, Northern Ontario, Minnesota and North Dakota. And just recently we were invited to participate in an amateur talent fund raising evening in support of the University of Winnipeg’s Virtuoso Concerts where we were awarded the Judges’ “might be able to quit the day job” prize! NOT AVAILABLE FOR PERFORMANCES CURRENTLY – SORRY! In the summer of 2014 we gathered together to test our “sound”. Even though we were four individuals with diverse backgrounds and skills, we found we were able, from the beginning, to “lock” chords to create a beautiful a capella sound in the barbershop style! That has spurred us on to create and work on a repertoire of songs that we think you’ll find enjoyable and entertaining. As you can see from our picture, three out of four of us agreed that Hats Off would be a great name for a quartet! 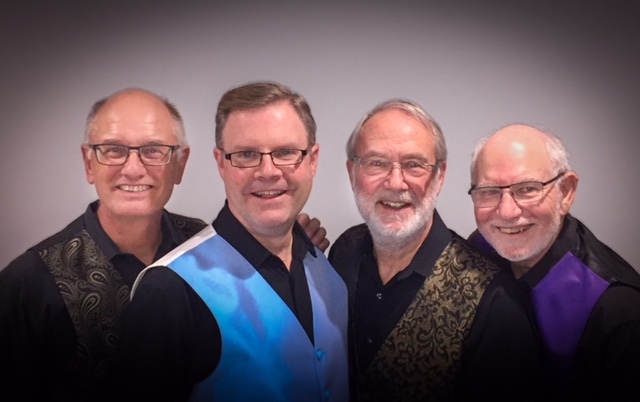 Hats Off is: David Peters (tenor), Victor Olafson (lead), James “Doogie” Kautz (baritone), and Ken Broadfoot (bass), David has been a part of the Manitoba music scene for several years and has sung in a variety of vocal groups. Victor started as lead singer for what he calls a machine-shed band, the Dreamers and also played piano, guitar, and trumpet. He has been in 3 previous quartets and was an Assistant Director of the Winnipeg Golden Chordsmen. “Doogie” has been singing since he could talk, in a variety of groups, ranging from pairing up with siblings and cousins, to singing bass in a Bible school traveling chorus. He is currently a music leader in his church. Ken has always loved singing and listening to music and finally “found” barbershopping just a few years ago. We would love to sing at your anniversary or birthday party, fund-raiser, group or corporate event, or any other situation calling for a bit of quality musical entertainment. You can contact us at hatsoffbsq@gmail.com or call Ken at (204) 253-8817. Prairie Wind blew onto the scene in the summer of 2016, debuting at one of the Golden Chordsmen’s BBQ events. We are: Brian Duplak (Tenor), Chris Magas (Lead), Larry Bredesen (Bass), and John Latham (Baritone). A major challenge has been finding time to get together and rehearse because of our busy schedules outside of Barbershopping. So we were thrilled to perform in our first Spring Show with the Chorus in 2018.